Get a glimpse of the College of Pharmacy through the eyes of our students. Good morning, everyone! My name is Victoria and I’m a fourth year #PharmD student. I’ll be taking over the college’s Instagram and showing you a day-in-the-life of an APPE student. Today’s gonna be a great day – so glad you can join me! 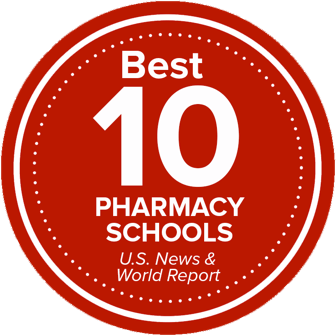 During your final year of the PharmD program, students complete nine, month-long clinical rotations in a variety of pharmacy practice settings. This month, I’m on an “academic pharmacy” rotation at the college with Dr. Kathy Kelley. One of my assignments on this rotation was to design and deliver an orientation session for our incoming first year pharmacy students. Today, I delivered a presentation called “Adding Value(s) to Your Emerging Pharmacy Practice”. Coffee break! There are so many amazing coffee options within walking distance of the college and I’m not ashamed to admit I’ve tried them all! This caffeine kick is just what I need for a productive afternoon working on projects for my rotation. For one of my other rotations, I’m working with the @osuccc_james Outpatient Pharmacy on a patient care project. This pharmacy setting is pretty unique – it’s a specialty pharmacy located within the James Cancer Hospital. At the end of a long day, I like to take a little time to do something for myself. Today, I’m spinning at the @osurec. If I were to give any advice to #new2osu students, it would be to remember to take care of yourself too! Hi everyone! My name is Adam Ard, and I am a fourth-year chemistry major minoring in pharmaceutical sciences. When I'm not on the football field with the marching band, I'm in one of the labs at the College of Pharmacy as a SURF student. During the fellowship, I have been fortunate enough to work on the synthesis of a 20S proteasome inhibitor, Scytonemide A. Originally isolated from cyanobacteria, this molecule has the potential to be a novel anticancer therapeutic. At the end of the fellowship, all of the SURF students are asked to present on what they've been working on throughout the summer. I'm spending time this afternoon getting ready to share my work and the experience I've gained as a chemist. A whole summer of hard work has boiled down to this moment! Time to share my research and show the steps we’re making in the lab towards a cancer-free world. Now that we’ve presented, its time to end the day with an ice cream social. Thank you for following along with me today as I wrap up my time with the fellowship program. Stay tuned for another #OSURxTakeover coming soon! Good morning Instagram! I’m Sophia Liva, a fourth year PhD candidate in the Division of Pharmaceutics and Pharmaceutical Chemistry at the College of Pharmacy.Today, I’ll be showing you a day-in-the-life of a graduate student. I’m starting my day off with a stop for coffee on my way into the lab. A typical morning always includes coffee while I check emails, prepare for meetings and plan out experiments for the day. Gowning up for some pre-clinical work! Today, we’re performing functional assessments to learn about the benefits of the agents we are working with in the lab. Pictured here is a cross section of the gastrocnemius muscle. To assess our drugs for efficacy, we use imaging software to measure the area of the individual fibers that make-up the muscle, providing us with details about structure and abnormalities. I love being at the university because of the programs we have access to and the learning environment. Ohio State fosters collaborations between scientists and clinicians, which creates exciting and distinct training opportunities. My piece of advice for #new2osu students is to find your “Why”. For me, it’s to improve the quality of life and daily functions for cancer patients. From my exposure in this field of research, I’ve found fitness to be an integral part of life. Good morning Instagram! I’m Riley Mullins, a fourth year BSPS and pre-med student, with a goal to do everything in the major except pharmacy. I’m excited to take you with me into the lab today! Though school is out for summer, I’m still working hard. This summer in Dr. Chris Coss’s lab, I will continue doing my part to improve liver cancer outcomes by studying the role of the androgen receptor in the disease. On a typical day, I'm performing experiments in the lab. Here, I’m growing bacteria to isolate their DNA. Working in the lab gives me an awesome opportunity to use the skills I learned in the classroom in real life to benefit medicine. One of my pieces of advice for #new2osu students is find a mentor in something you’re interested in! Working with Dr. Coss has taught me so many things that I am excited to bring with me through the rest of my career. When I’m not reading science literature, I do my best to discover new knowledge that adds to our understanding of liver cancer. Wrapping up my day in the lab looking at a Western blot. That does it for my #OSURxTakeover! Thanks for joining me today in the lab and watch out for more takeovers coming soon. Hi everyone! I'm Vyishali Dharbhamalla, a third year PharmD student at the Ohio State College of Pharmacy. I will be taking you behind-the-scenes today during Senator Matt Dolan’s visit, which I helped plan through the new Advocacy Collaboration! Senator Dolan is joining us today to talk about state-level provider status and his passion for pharmacy. We are so excited to have him here and speak with us! It’s time for me to sign off! Thank you Senator Dolan for spending time at the College of Pharmacy today and a huge thank you to everyone for following along during my #OSURxTakeover. See you next time! Hi everyone! My name is Faria Munir and I’m a third year PharmD student here at the Ohio State College of Pharmacy. I’m so excited to start the inaugural student #takeovertuesday and show you a day in my life at Parks Hall. Finishing up the first half of classes with Pharmacology & Therapeutics. Coffee is definitely a needed item for long days like these. Professional hour is a one hour gap for student organizations to have meetings during the day. Being involved in student orgs is my favorite part of pharmacy school! Here I am with the rest of the SPADE executive board team. All of the classes for PharmD students are in Parks Hall, so I spend most of my day right here in this room. Having great company definitely makes learning that much more enjoyable. The last part of my day consists of working on my research project with these great faculty mentors. Getting involved with research is such a great way to learn more about the practice of pharmacy and share your results with the profession! Thanks for spending the day with me! I hope you learned a bit about what goes on "behind the scenes" here at Parks Hall! Look out for more upcoming student takeovers in the future!